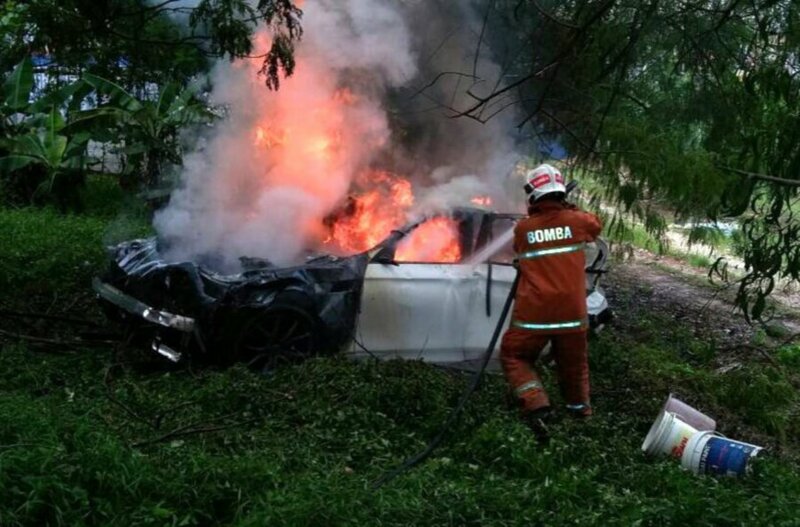 KLANG: Four members of a family were hurt when the car they were travelling in plunged into a ravine before bursting into flames at a roundabout near Bukit Raja industrial park today. Sungai Pinang Fire and Rescue Department chief Zaidi Ahtan said the accident, at 2.07pm, happened when the driver of the BMW lost control of the vehicle while negotiating the roundabout. "He failed to make a turn at the roundabout and the car skidded before plunging 1.5 meters down to the sloping area. The car then caught fire and luckily, passers-by were able to pull the victims out to safety. "The fire was put out by a team of six firemen. The victims have been sent to the Tengku Ampuan Rahimah Hospital in two ambulances," Zaidi said. The victims were identified as Yahya Ismail, 41, his 39-year-old wife Nor Azwa Mahmud and their children, Denish Farhan and Dalisha Farhan, aged 11 and 8 respectively. Zaidi said all four sustained facial and bodily injuries while Dalisha Farhan broke her right leg in the incident. I'm shocked to read the post. But they survived 4. Thanks to staff of fire brigade All of us should be cautiously driving. Thanks to the post to make us aware. Do you need to write an admission essay paper please visit our site. Hello, I am a writer of that site and I provides some good quality writing services for my students for their academic helps. You also can get more good quality writing services form our sites. Thanks!